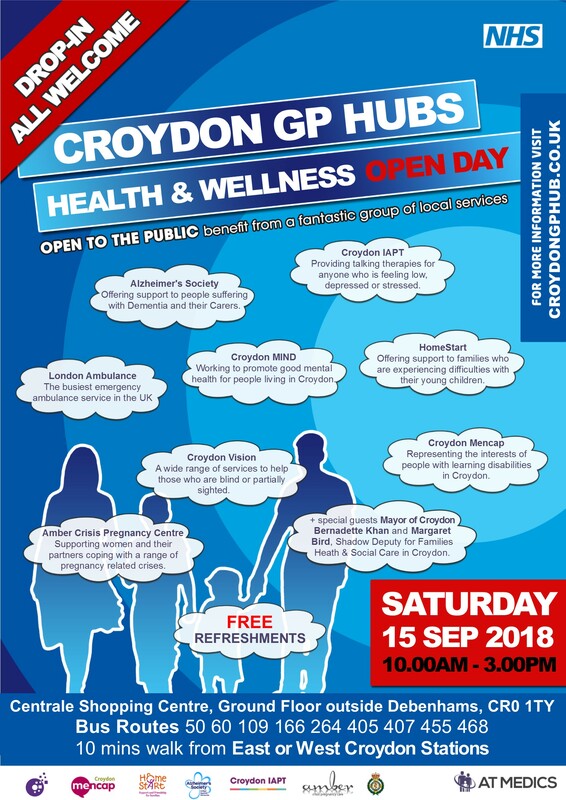 The GP Hubs in Croydon will be hosting a Health & Wellness Open Day for all members of the public on Saturday 15 September 2018 from 10.00am-3.00pm in the Centrale Shopping Centre, just outside Debenhams. See poster below. The event aims to raise awareness about and allow patients to experience a number of local health and social care service providers accessible through the Croydon GP Hubs and directly by residents of Croydon. Visitors will be treated to FREE refreshments and will have the opportunity to meet the Mayor of Croydon, Councillor Bernadette Khan, the Shadow Deputy for Families Heath & Social Care, Margaret Bird, and members of our team across our Croydon GP Hubs. Mencap, a charity that represents the interests of people with learning disabilities, their families and carers within the London Borough of Croydon. Croydon IAPT, representing the interests of people with learning disabilities within the Croydon borough. Croydon MIND, a non-profit organisation working to promote good mental health for people living in Croydon. The London Ambulance Service, the busiest emergency ambulance service in the UK, serving more than eight million people who live and work in the London area. Croydon Vision, who provide a wide range of services to help those who are blind or partially sighted to live as independent, confident and fulfilled lives as possible. Amber Crisis Pregnancy Centre, who support women and their partners, in the South London area, coping with a range of pregnancy related crises. Margaret Bird, the Shadow Deputy for Families Heath & Social Care and a member of the Health & Wellbeing Board for Croydon Council. A number of other services will also be present for the whole family to benefit from. GP Hub Parkway, GP Hub Purley and GP Hub Central Croydon provide extended and urgent access to GP services 365 days a year, from three locations for all residents of Croydon, and have been delivering this service since 2016.